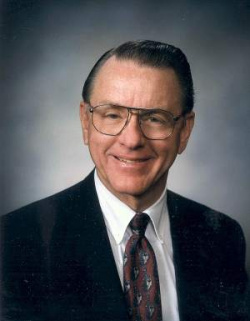 Keith Crockett served as a General Authority in the Second Quorum of the Seventy of the The Church of Jesus Christ of Latter-day Saints. He was called in April 2000 and was released in October 2004. Crockett was born on January 15, 1934, in Pima, Arizona. He attended Eastern Arizona College and received his bachelor’s degree in music education and his master’s degree in educational administration and supervision, both from the University of Arizona. He holds an EdS in administration and supervision from Northern Arizona University. He worked as a high school music teacher before working as an instructor and director in the Church Educational System in Arizona. He married Kathleen McBride and they are the parents of six children. He has served in the Church as a bishop, stake president and counselor, a high councilor, and a temple ordinance worker. He presided over the Buenos Aires South Mission from 1993 to 1996. He also served in a full time mission to Uruguay as a young man.